Chris grew up in Texas before moving to Maryland in 1992 where his dedication to golf began. Chris Hanson grew up in the Southwest before moving to Maryland in 1992 where his dedication to golf began. He started his professional career as an Assistant Golf Professional at the Country Club of Maryland where he averaged 200 individual golf lessons a year as well as organizing numerous Ladies’ and Junior Golf clinics. He gained his official PGA Membership in 1996. After working at Beechtree Golf Course for two years, Chris joined Baltimore County Golf as the Head Golf Professional at The Woodlands Golf Course where he ran the Diamond Ridge/Woodland Junior Clinics. Chris then served as the Head Golf Professional at Greystone Golf Course for 7 years before landing in his current position as the Head Golf Professional at Fox Hollow Golf Course. 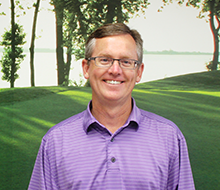 In this role, Chris was part of the redesign team of the back 9 at Fox Hollow, as well as the creation of the state of the art practice facility that has been named a Top 50 range in the United States by Golf Range Magazine in 2012, 2013, 2014 and 2015. With over 20 years of teaching experience, Chris looks forward to teaching all levels of golfers and helping them with all aspects of their game. For more information on 1 hour, 2 hour and 3 hour group clinics, please contact the golf professional directly.